This simple frame building in the Georgetown County community of Yauhannah sits behind the modern Mt. Tabor Baptist Church. 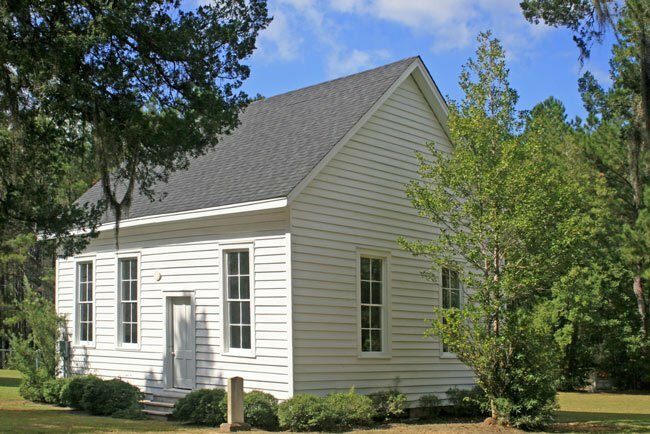 The small white sanctuary was built as the congregation’s second church in 1881. 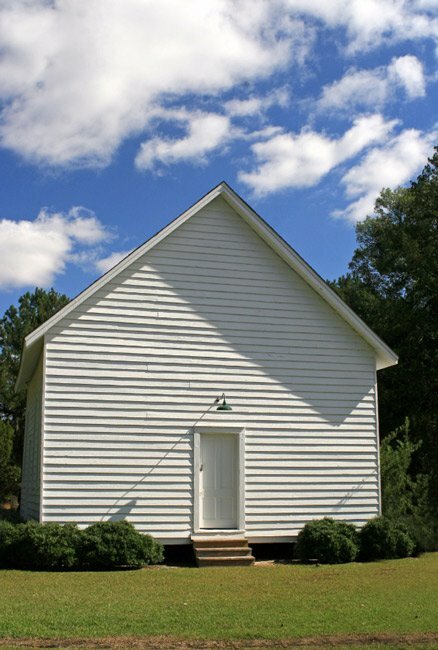 The congregation was organized on October 21, 1832 when a branch of the Little Pee Dee Baptist Church was formally recognized as Mt. Tabor Church of the Missionary Baptist Faith. A few weeks after its formation as Mt. Tabor, the congregation petitioned for admittance into the Welsh Neck Association, an affiliation with roots dating to 1736. 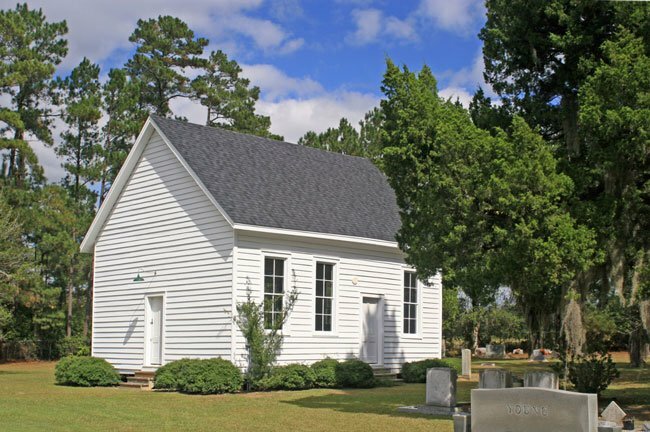 During that year Welsh Baptists from Delaware and Pennsylvania settled along the Great Pee Dee River and established a community called Welsh Neck. Welsh Neck Baptist Church in Society Hill was the first church established in this eighteenth-century settlement and remains active to this day. The first church to house Mt. Tabor Baptist was made of logs and is no longer extant. 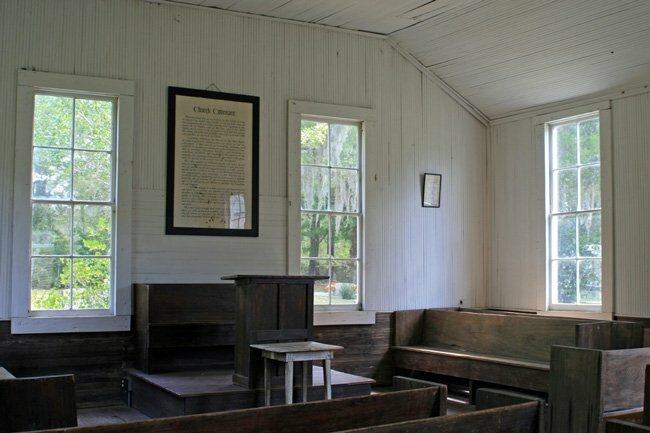 When members decided to replace the cabin with this church, cypress trees where harvested from a nearby swamp. The logs were then floated down the Waccamaw River to nearby Bucksville in Horry County to be sawed at Buck’s Mill, the first steam-powered lumber mill in the Southeast. The lumber was then sent back to Yauhannah and hauled by oxen to the site where the church now stands. 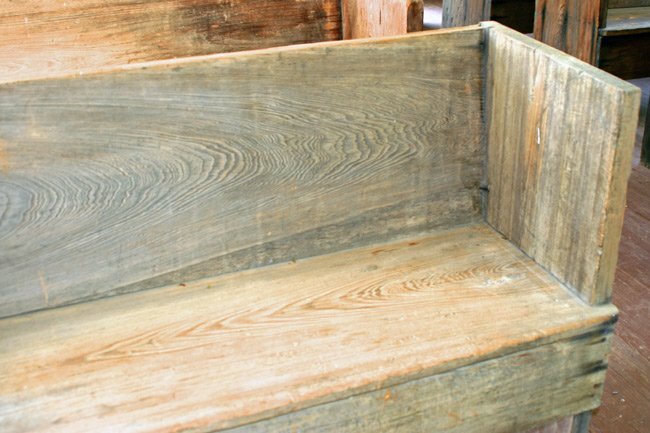 The church pews, which remain in the historic sanctuary, were hewn of the same wood. A new brick church was built in 1956, and a fellowship hall was added to the new building in 1972. However, special services are still held occasionally in the old church. Contributor Bill Segars shares his experience photographing this historic church: “When I read about Mount Tabor in Yauhannah back in 2009, I said that I must go to this place. This little building is behind their present church building that they use now. Interesting note: The seat is made of one board 16″ wide, the back is also one board 22” wide. Beautiful heart pine lumber.